SAP HCM solution brings about providing the global business practices with Indian tax compliance as a solution for a company’s HR and Payroll processing needs. India Localization at SAP ERP HCM provides for business process requirements specific to the Indian Companies. The India Localization for SAP ERP HCM has been developed after an extensive study of Indian tax and business practices across industries and organizations of varying sizes. Since its inception, a dedicated team has been enhancing and supporting the localization features and functions well integrated with the SAP ERP HCM solution. Close interaction with Indian SAP ERP HCM customers has been a key success factor. India Localization provides complete compliance as per the provisions of laws governing India taxation methods. India Payroll solution responds to tomorrow’s needs today. It is flexible, reliable and designed to meet India payroll requirements. From ‘configuring’ rules to arrive at the salary, taxation to Provident Fund contributions and deductions, Loans etc., SAP India Payroll calculates employee’s compensation accurately and efficiently. If employee’s pay details have changed back dated, the retroactive processing program automatically recalculates pay, deductions, and taxes. The revised figures update the employee’s history, payroll and tax records as well as ledger entries. SAP India Payroll offers a suite of state-of-the-art functions that cover the daily requirements of those working in the payroll management environment. Payroll calculation, implementing new schemes, analysis of various reports is much faster. Compliance: SAP India Payroll delivers legal compliance and best practices. The world's leading payroll solution that is currently used by thousands of organizations worldwide. SAP India Payroll can handle a number of scenarios with different variations of basic salary and increments which are normal or due on promotion of the employee. Dearness Allowance SAP India Payroll computes the dearness allowance using options such as Fixed DA, linkage to consumer price index . Any number of wage elements can be created and used for administering compensation. These can be regular monthly wage elements or periodic wage elements or annual/one-off wage elements. The wage elements can be assigned to various employee groups depending on their characteristics such the department of the employee. SAP India Payroll can handle multiple allowances and reimbursements. You could define characteristics for payment, taxability, computation and so on to suit your organizational requirements. SAP India Payroll supports multiple user defined deductions from salary. The standard loans functionality has been enhanced to meet the requirements of eligibility, maintenance of balances, computation of interest and monthly installment repayment and the perquisite computation relating to interest subsidy for company loans. 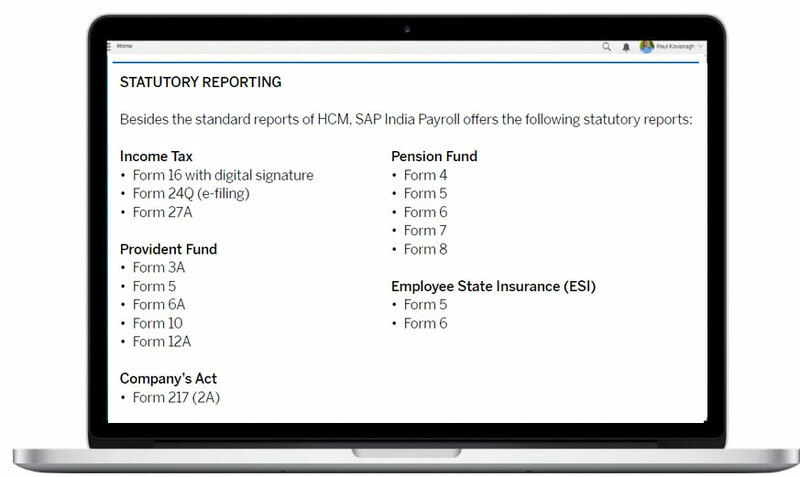 SAP India Payroll computes varied benefits provided to your employees such as Leave Travel Allowance, Medical Reimbursement, Medical Insurance, Furniture, House Rent Allowance, Company Cars, Company Housing and other long term reimbursements. The SAP India P ayroll offers the functionalit y of FBP/Basket of Allowances practice as seen in a number of companies. This provides limits on the FBP, sub-limits on individual components of the package and the processing of outstanding balances during and at the end of the year. Designed to comply with the individual Income Tax Laws of India, the system stores all your employee tax details, including Previous Employment tax and Professional tax. The tax calculations take into consideration employee’s taxable income, tax slabs, deductions permitted, applicability of surcharge and any additional cess. SAP India Payroll automatically computes the Provident Fund benefits, ESI eligibility and contributions, Labour Welfare Fund contributions and Professional Tax for states where applicable at the relevant frequency. SAP India Payroll has been configured to address requirements for employee separation due to resignation, retirement or VRS. It can handle recovery of benefits for part year service, payment of terminal benefits, Notice Pay and Tax computation only for part of the year. Besides the regular payroll, companies have sundry payments processing requirements. SAP India Payroll supports off-cycle payments along with the computation of respective tax. SAP India Payroll supports retrospective computation of changes to the various data heads and makes the appropriate computation and payments in the current period. One of the recent significant enhancements provided at localization for SAP ERP HCM: India Payroll is “Correction Run”. Corrections on a payroll may be required for the reasons such as, wrong base amounts, missing allowances, tax related errors etc. As of now impacts of such errors can’t be addressed until the next payroll. India Localization now provides for such corrections via “Correction Run” enhancement.